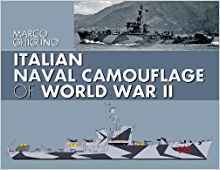 This is a major new study of Italian naval camouflage schemes developed and used during World War II. When Italy entered the War in June 1940, the Regia Marina (Italian navy) was a force still under development and both Italian warships and merchant ships started the war in their peacetime colors, although prewar plans had been made for camouflaging ships. At that time, all the principal warships were painted in a light matte grey (“grigio cenerino chiaro”), that was adopted in the 1920s and early ‘30s. With the advent of war, and the start of convoy traffic to Libya, the need to camouflage ships for purposes of deception, rather than outright concealment, became apparent and the first initiatives were undertaken. Employing contemporary schematic drawings, photographs, and his own CAD profiles, Marco Ghiglino, describes the development of the varied schemes that were adopted for the capital ships, such as Caio Duilia and Littorio, cruisers, destroyers and torpedo boats, landing craft, and merchant ships; even the royal yacht and small tugs were given camouflage schemes. Ghiglino depicts all the ships and their schemes, at different dates, with both sides of the ship shown where possible, in his own beautifully rendered schematic profiles, all in full color. It is this section with more than 700 drawings that gives the reader a complete and detailed picture of the development of Italian naval camouflage. He also looks in detail at the Greek theater where there were many exceptions, influenced by the German presence and by the camouflage schemes of captured vessels. This major new reference book will prove invaluable to historians, collectors, model makers, and wargamers and follows in the wake of the hugely successful editions covering German and British camouflage schemes of World War II.